CHANCES ARE, THAT'S WHAT YOU WILL GET!" CHECKING ON THE STATUS OF OUR INVENTORY OF YOUR ORDER! COMPARE, QUALITY CONSIDERED, WE HAVE THE LOWEST PRICE ANYWHERE! Wall members 16" o.c., Rear ramp with flap or Barn doors 3/8" Plywood walls Floor members 16" o.c., 3500# leaf spring axles. NOW PICK YOUR OPTIONS: WHITE Or BLACK | FLAT Or VEE NOSE | REAR RAMP Or BARN DOORS, SAME PRICE! 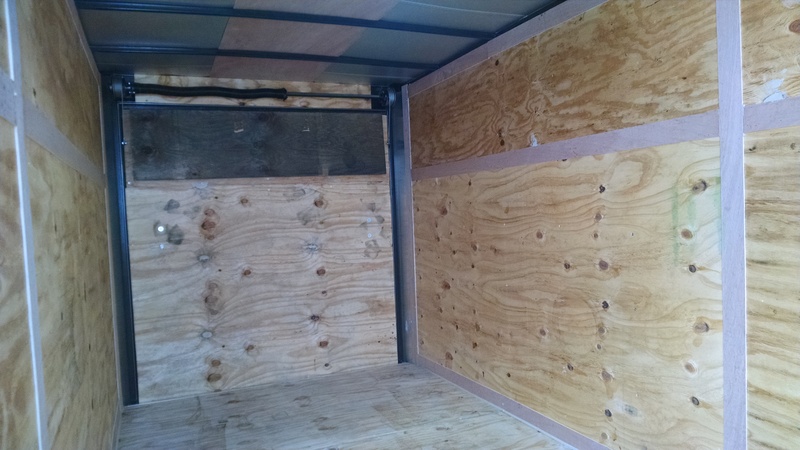 We Build The Box, and Then ADD The Vee Nose For A Larger Trailer. WITH NEW LOWER PRICES FOR 2018! THIS IS THE DIRECT GEORGIA PLANT PURCHASE & PICKUP PRICE. MARKUP IF YOU SELECT ANY OTHER DELIVERY POINT. ABOVE IS THE DIRECT GEORGIA PLANT PURCHASE & PICKUP PRICE. 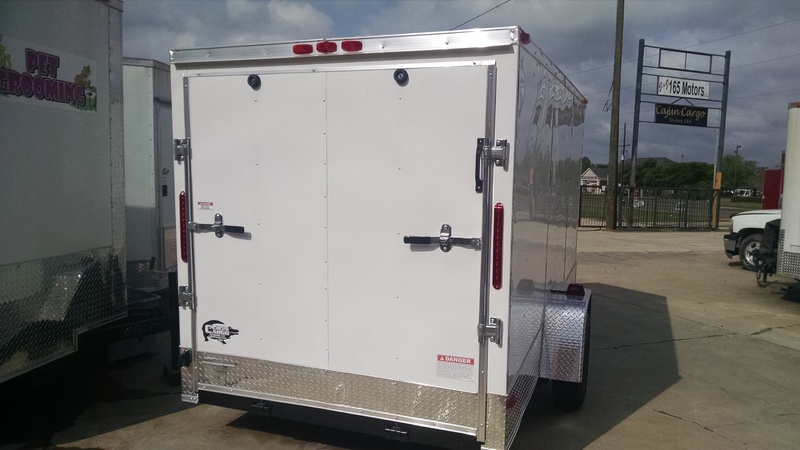 "YOU CAN REQUEST" INSTALLING THE SIDE DOOR IN THE VEE NOSE TO GAIN WALL STORAGE, AND "YOU CAN REQUEST" OUR SLOPE NOSE ATP DOWN TO MEET THE 12 INCHES OF ATP ON THE SIDE WALLS, TO GIVE YOU A SPECIAL ONE OF A KIND TRAILER. MARKUP, IF YOU SELECT ANY OTHER DELIVERY POINT. NOTE: ALL PRICES FOB PEARSON, GA--other locations higher due to shipping. ASSIGNMENT of MSO, Bill of Sale, TitleTransfer Fee, Notary Fee (if any), Temp Tag Fee. There Is NO SALES TAX DUE At Delivery, You Pay Any Sales Tax Due To Your State DMV. CHECKING ON THE STATUS OF OUR INVENTORY OR YOUR ORDER! INCLUDING THE LOCAL INDEPENDENT DEALER MARKUP. YOU MAY CALL THE MONROE, LA TRAILER DISTRIBUTION CENTER @ 318.398.7447 FOR THE LA PRICE. Call today to see about availability of the size you like, or to place your order. 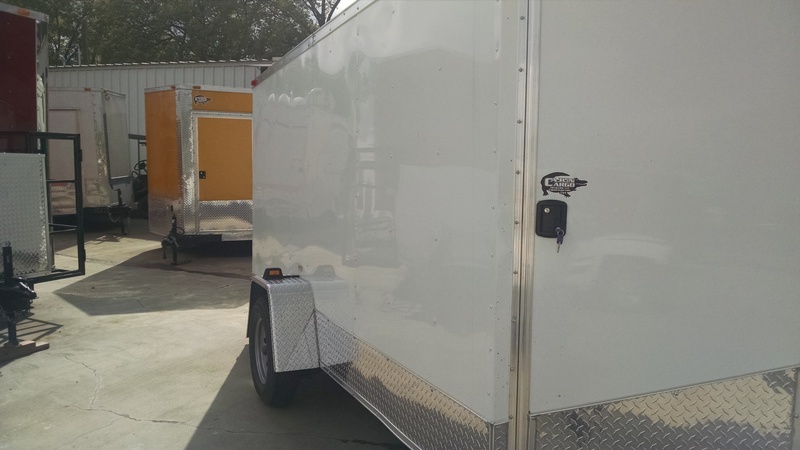 Depending on inventory and time of year, lead time on trailers is generally about 3 weeks. Why would you buy from the guy that is "caught up" AND has no business? For stock trailers a $200-$1000 (depending on size) non-refundable deposit is due to build and hold a trailer for up to 30 days. For custom built trailers, a $1,000-$9,000 non-refundable deposit is due to start production on a custom built trailer. WE NOW PROCESS ALL DEPOSITS THRU "PAYPAL"
NO CREDIT CARDS OR PERSONAL CHECKS. TO GET A LOWER PRICE, CHANCES ARE, THAT'S WHAT YOU WILL GET". CHECKING ON THE STATUS OF YOUR ORDER, OR OUR INVENTORY, WHICH CHANGES FAST!